Before I go to bed each night, I put a big bottle of water on my nightstand. I drink it during the night, and finish it off first thing in the morning so I get a good start on meeting my water goal for the day. (Full disclosure, that picture is NOT my nightstand, it’s Whit’s. His nightstand has four things on it, mine looks like a goat exploded). Anyway, I also like a cup of chamomile tea before bed. So I have a minimum of two beverages on a wooden nightstand. And yes, I’ve ruined many over the years. 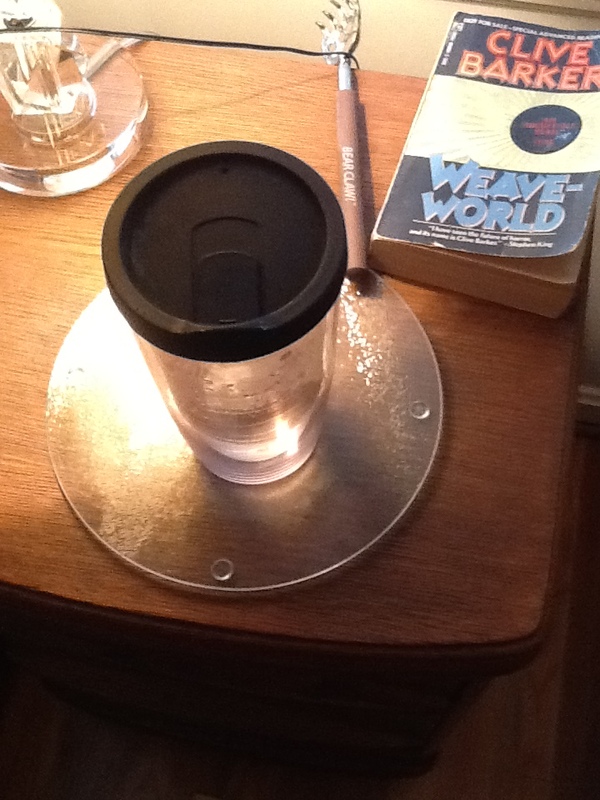 You see that lovely glass round under that glass?That’s a glass cutting board, repurposed as an extra-large coaster. Get this, I found them at the dollar store. They’re only about 8” across so they’re much too small for a cutting board, anyway, but they make an excellent coaster. Reasonably attractive and they have little rubber feet so if any water gets underneath it’ll dry without ruining your furniture. I bought like five of them, never know when they’ll come in handy. I’ll keep one under the carafe I keep on the dining room table and vases too so when I refill I don’t have to worry about water rings. Yay me!